Pastor O's Blog: Parents, Obey your Children? This morning's sermon on Colossians 3:20 (Children, obey your parents...) was geared toward our children, youth, teens. Involved in the proceedings were a Wii Remote, a Squirt Bottle, and...a children's book called Skippy Jon Jones. 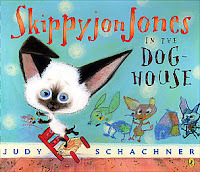 I like the Skippy Jon Jones Series (in part because I enjoy talking in a Hispanic accent, probably wrong! !, and there's a lot of that required in these books). This one was called Skippy Jon Jones in the Dog House. But upon reflecting a little more on these books I feed my children, it's disconcerting that a child's disobedience is overlooked while he's lauded by book's end as the hero because of his imagination and creativity. It's the kind of thing discussed in this insightful article by Dr. Al Mohler, "Children Obey Your Parents." It's worth your while, parents, to read and consider - so as to not let solid, biblical parenthood drift into oblivion (or Disney TV tween programming). Tomorrow I am off on vacation with the fam through the rest of July. So this will be my last blog entry for the month. Many blessings! I wish You nice holidays! Yes, today obedience isn't popular among young people, but fortunately not everyone goes according to the fashion.